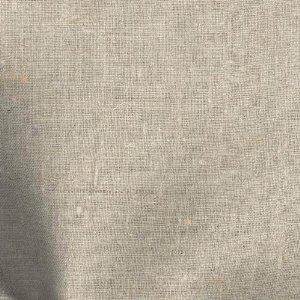 Linen fabric dates back to 8000 BC making it 4000 years older than both cotton and silk. 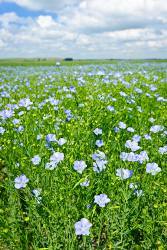 Just about every country has cultivated the flax plant from which linen is developed. Growing flax that will result in quality fibers requires care and attention during the growing and harvesting periods. 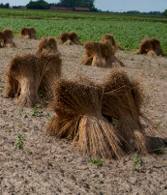 Flax plants are either pulled out of the ground or cut close to the roots when harvested. Hand-pulling has the reputation of producing better-quality linen. “Winnowing” or “rippling” removes the seeds. Fibers are then loosened from the plant stock by “retting”, broken away from the inner bark and crushed between rollers to remove the woody parts. “Heckling combs” separate the short from the more desirable long fibers. The finest fibers, called line or dressed flax, can be up to 20” long. From here, the fibers are spun into yarns and then woven into different grades of linen. Belgian and Irish linens have long been considered the most excellent quality. Since the flax plant actually enriches the soil and nothing is wasted during the manufacturing process, linen is the perfect natural fabric for today’s “Green” movement. The breathable and wicking properties of linen make it very desirable for hot climates. Linen is becoming on nearly everyone in its natural colors of cream and beige. Light weight weaves are excellent for blouses, tops, shirts, dresses, chemises, lingerie and children’s wear. Medium weights work well for summer pants, men’s shirts, dresses and skirts. Heavy weaves tailor nicely in blazers, jackets, suits, men’s trousers and historical costumes. Pre-shrinking is a must and can be done by washing in the same water temperature as the completed project. Linen will soften considerably with subsequent washes. Even dry cleaning will cause shrinking, so dry clean or use a good iron with heavy steam and a damp press cloth for garments that will be dry cleaned when completed. Purchase at least an extra 1/8 yard for each yard suggested and a little more for loosely woven linens since these are prone to more shrinkage. Light or medium weight linen is excellent for the beginner since it’s less likely to shift during cutting, feeds through the sewing machine with ease and is more forgiving if stitches need to be removed. Using pinking shears or a rotary cutter with a pinking blade will greatly reduce the fraying associated with cutting linen. Serge or zig zag straight-cut edges before construction to eliminate raveling. Non-wax chalk, marking pencils or tracing paper work well for tracing darts, etc., but tailor’s tacks do better on heavier weaves. Carefully placed pins work well, but are more likely to slip out of coarser weaves. Match interfacings to the weight and weave of the linen and consider a suitable sew-in product for tailored or any garment subject to multiple washings or dry cleanings. Using a good fusible knit as an underlining adds structure and will reduce the amount of wrinkling so indicative of this fabric. Sew with good quality basic threads such as cotton or cotton-wrapped polyester and, although natural fibers such as linen won’t dull a needle as quickly as synthetics, it’s advisable to begin each project with a new needle. Press each side of the sewn seam to set the stitches, then press the seam open from the wrong side over a seam roll, ham or half-round wooden seam stick to eliminate ridges on the right side. “Dea Linigera” is a name attributed to the Egyptian goddess Isis. It means “Linen Goddess.” Priests who belonged to the Isis cult were called “linigeri”... wearers of linen.